In this system, the lowest string acts as an axis of symmetry. This tuning is easy to adapt for people who play the Chapman tuning and wish to try the bass in fourths, just by re-tuning a few strings. During the summer of 1985, I was still playing the Chapman tuning. I decided that, as a music reader, I could not go anymore with the fifth-fourth tuning, which I found too complicated, especially as I wanted to read music and play « bass lines » in the sense of Bach. 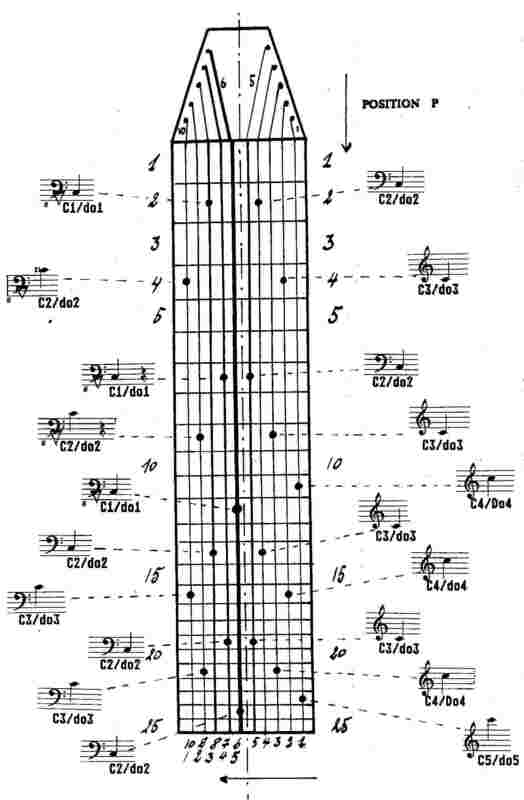 And so, on a suggestion from Jim Lampi, I tuned my bass in fourths, This tuning became known as the « mirrored fourths » tuning. Figure 1-3 Tuning 10 strings in mirrored fourths, crossed hands. Notes at row 9. Figure 1-4 Tuning 10 strings in mirrored fourths, crossed hands. The setting is analogue to the Chapman tuning but with the bass in fourths instead of fifths. We give in the variant of the same tuning for a ten strings instrument. Tuning word; « 1<5_bass_4ths_LH // 5_mel_4ths_RH>10 » seen from the player.